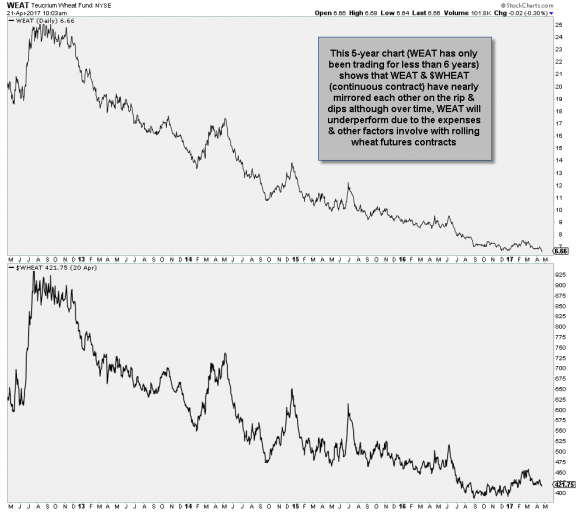 While I’ve addressed the pros & cons of trading commodity ETNs as well as my reasoning for posting analysis & trade ideas on the site in the past, I believe this is an important topic that should be revisited, especially in light of my recent post highlighting various agricultural commodities that appear to be setting up for potential rallies in the coming months. The argument, or opinions expressed by other traders on more than one occasion on the site, is that commodity tracking ETNs are horrible trading & investing vehicles that should be avoided due to their underperformance of the underlying commodity that they are tracking. As with most things in trading & investing, this topic is somewhat complex & there are several factors that need to be considered in the debate of whether or not one should use commodity ETNs to gain exposure to a particular commodity that they are bullish or bearish on. seriously, why are you playing these agriculture commodities? look at any one of these weat,jo, jjg, etc. there is a big drawdown effect over time. compare the continuous contract to what your playing. look at JO for example vs the continuous contract of coffee over time….sure easy exposure with ETN’s like JO….but right from the start your down…lol. don’t be a fool. 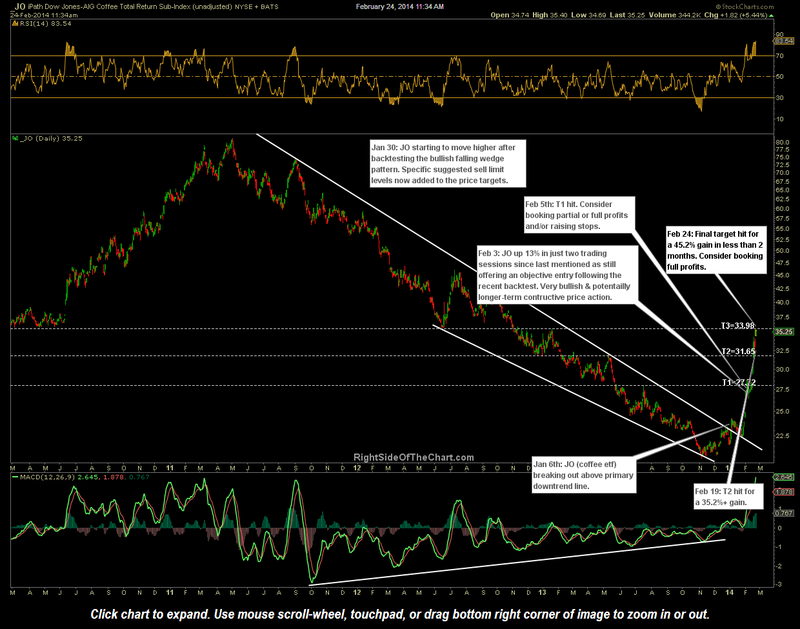 I see that someone mentioned that they’re in it for the long term w/ these ETN commodities….wake up! Randy….you still cant convince me. if you look at the returns over time on a percentage basis your at a big loss. ok you might catch the trend here and there but for me I want an equal playing field. example…..I would rather be trading XOP, XES or XLE for crude oil than playing USO. the stock ETF’s have very low expense and drawdown is nil. when someone new comes on this site please stress this point that you not on an equal playing field. I feel like I am on a football team playing against an equal opponent in size, strength and smarts but my team is always receiving the ball at the bottom of the hill and have to make our exhausting way upward to the goal line on top of the hill…lol. except for playing the true commodity, the etn’s you mention hear underperform the commodity each passing day…compare and you’ll see. I know a commodity broker that advised me strongly if someone even mentions them…RUN, RUN THE OTHER WAY…lol. I did look at what he was talking about and its soooooo true. there’s plenty of great undervalue beat up stocks out there w/ good divies…bring them on. randy….honestly and I don’t mean to BYB but you should and if I were running this site mention first or highlight this drawdown to folks esp. the inexperienced. when you mention R/R and long term that’s kinda in my opinion misleading. 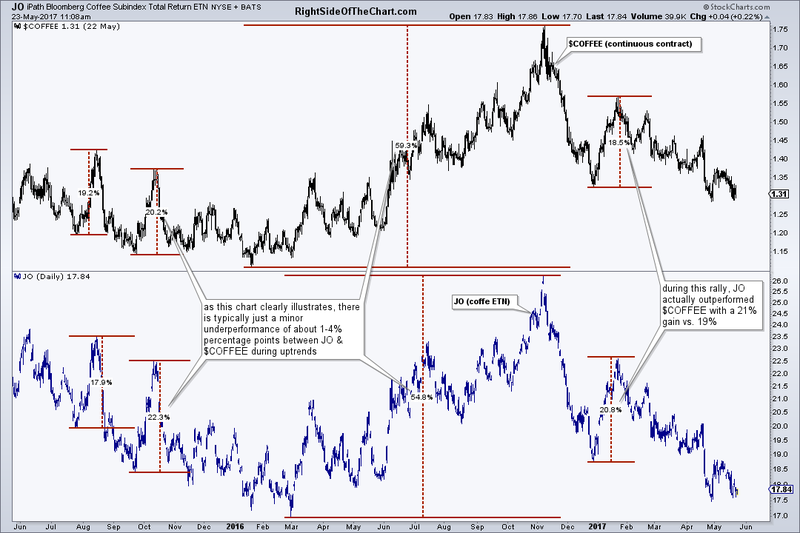 for example compare JO and $coffee for the past year…long term??? you gotta hit the nail on the head and get the hell out…if you $ dollar cost down in the long run…your screwed. My reply to those comments below will including some excerpts that I’ve cut & pasted from the previous replies as well as some additional commentary. 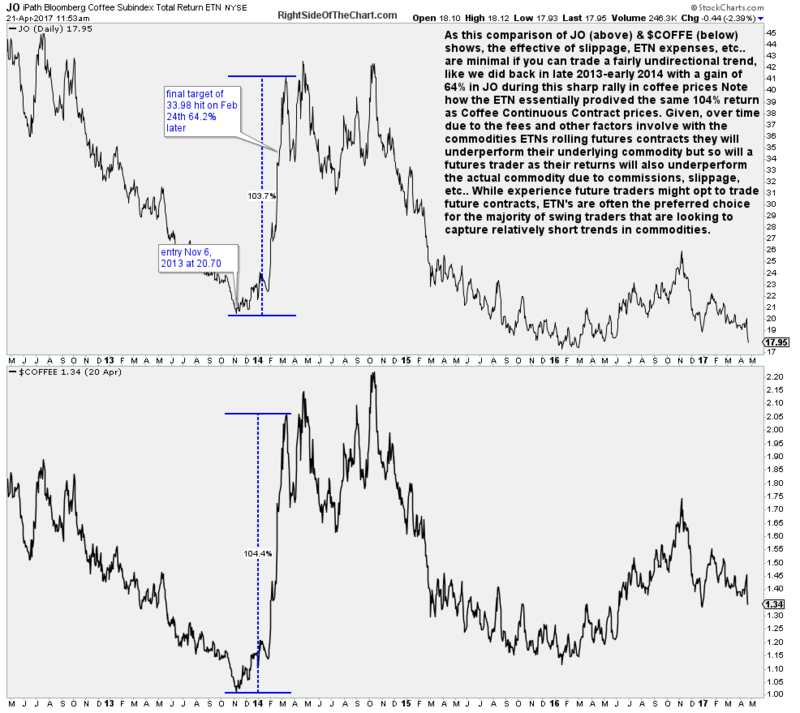 On the first comment above, good point in regards to trading XOP, XES & XLE vs. USO. Personally as well as the official trade ideas on the site, I will often trade XLE (or another energy related sector ETF) if bullish or bearish on USO although I don’t have an issue with swing trading USO, or any commodity tracking ETN for that matter as the vast majority of trades ideas posted here are swing trades with holding periods typically measured in days, weeks & occasionally a few months. As such, any decay or underperformance is usually minimal. Another consideration, which probably carries the highest weighting in my consideration to post analysis & trade ideas on commodity tracking ETNs is the fact that a large percentage of retail traders & investors, quite possibly the majority, do not have the experience, access (via a futures account) or the capital required to trade futures contracts. As such, I opt to post charts of commodity tracking ETNs although I also post charts of the spot or continuous futures contracts as well as specific (near-month) futures contracts both on the front page & trading room. Over time, yes, any commodity tracking ETN will most likely underperform the actual underlying commodity due to the management & internal commissions/fees, contango, etc. Then again, an individual investor will also underperform the actual commodity if trading futures due to commissions, contango, slippage, etc.. That’s simply the nature of the beast. Unless you live in Kansas & know a wheat farmer who will sell you bushels of wheat & you have a barn to store it in & very quick access to a local market to sell it (ditto for soy beans, coffee, crude oil, etc..) you can’t directly trade physical commodities so yes, everyone is guaranteed to underperform whether you trade futures or ETNs. With that being said, just because some traders don’t have access to futures wouldn’t warrant posting analysis on commodity ETNs if they were the “horrible, almost guaranteed-to-lose” trading vehicles that some make them out to be. In the second comment above, where a commodity broker strongly advised against using commodity ETNs (which is akin to a realtor telling you that selling your home as a FSBO on Zillow, Trulia, etc… is a colossal mistake), I think it was a mistake to take that advice as gospel without doing the proper due diligence or if he did as he stated, I would be curious to see the results as I have in the past & will share again below. Everyone told Columbus that the world was flat & he would fall off the edge if he sailed too far west. However, instead of accepting that as an immutable truth, he checked it out for himself & … well, we all know how that turned out. First of all, I opt to use the commodity trading ETNs in lieu of futures contracts for the official trade ideas on the site, even if I’m personally trading the latter. The reasoning being that is due to the fact that the majority of retail traders, especially those relatively new to investing or swing trading, do not have a ability nor the experience & knowledge to trade futures. While I do very much agree with the fact that over time, the commodity tracking ETNs will typically underperform the returns of the underlying commodity due to expenses associated with trading & rolling futures contracts in addition to the typical expenses incurred by all exchange traded products, I’ve found that most commodity tracking ETNs still provide a very efficient & effective means of profiting from short & intermediate-term trends (i.e.- swing trading) and even longer-term trades, given the right technical setup, such as the Long-term Trade in which we were able to successfully capture over 64% of a roughly 104% bull run in coffee prices using the coffee ETN, JO (see charts below). Not only did that trade work out for some very attractive gains but if you compare the gains between JO & $COFFEE (continuous contract prices) from the bottom to the top of that late 2013-early 2014 rip that we caught the bulk of, you’ll see that JO essentially produced the same return as did $COFFEE. I will say that the ETNs, just as with the leveraged sector ETFs, tend to track the underlying commodity (or sector) much better during mostly uni-directional trends, i.e- trends with very few counter-trend closes. (note, the last chart below showing the JO trade closed out points out the 45% gain on the swing trade that was entered on the downtrend line, not the alternative, aggressive entry on the long-term trade back on Nov 6. 2013 which was good for a 64.2% gain). One more example to impress my point that the underperformance, particularly when trading long (I will speak to shorting ETNs below) can be easily viewed on this 2-year comparison between $COFFEE (coffee continuous contract) and JO (coffee ETN). Not to busy the chart with too many annotations nor did I cherry pick, I simply measured the largest rally/bull trend as well as a few of the typical 20% or so rallies that have occurred in coffee prices over the last couple of years. As one can clearly see (the percentage gains for each rally are in the middle of the vertical dashed lines), the underperformance of JO to $COFFEE only ranged from about 2% on the 20% rallies to about 4% on the nearly 60% bull run in $COFFEE off the March 2016 lows. Anyone that finds a 55% rally in JO while $COFFEE rallies 59% as an unacceptable level of underperformance, by all means should either stand aside when they see a compelling long-side trading opportunity in coffee or use futures, if that is an option available to them. BTW- Also note the outperformance of JO vs. $COFFEE during the rally off the 12/28/16 low to the 1/25/17 high. Another important point to consider is what is one’s definition of “long-term”? While my primary trading style is swing trading, I also personally take & officially post what I refer to as “Long-Term Trade Ideas” which I define* as “…Trade or investment ideas that have the potential for significant returns over a longer-term period, typically several months or more. This category of trade ideas might be useful for the longer-term swing trader or investor looking for investment ideas to supplement their existing portfolio and prefers a less active, more hands-off approach to investing.” *The definition for each of the trade idea categories on the site can be found towards the top of the page on each of the respective trade categories. While some might consider a long-term trade or investment as something they buy & tuck away for years, I rarely hold a security for more than 9 months although I will book profits after an extended rally that might have lasted 6-9 months with the intention of buying back in after a correction, if one appears likely. As such, I might capture several legs within a trend that can last years but again, rarely riding out the almost inevitable double-digit pullbacks that are along the way. Just as I explain (on the FAQ page of the site) the detrimental impact of the decay suffered by holding leverage ETFs for an extended period of time, to a (much) lesser extend, a similar underperformance (although not caused by the use of leverage) occurs on the commodity ETNs and a such, you never have & probably never will see an official trade idea in a commodity ETN that last for a year or more on this site. 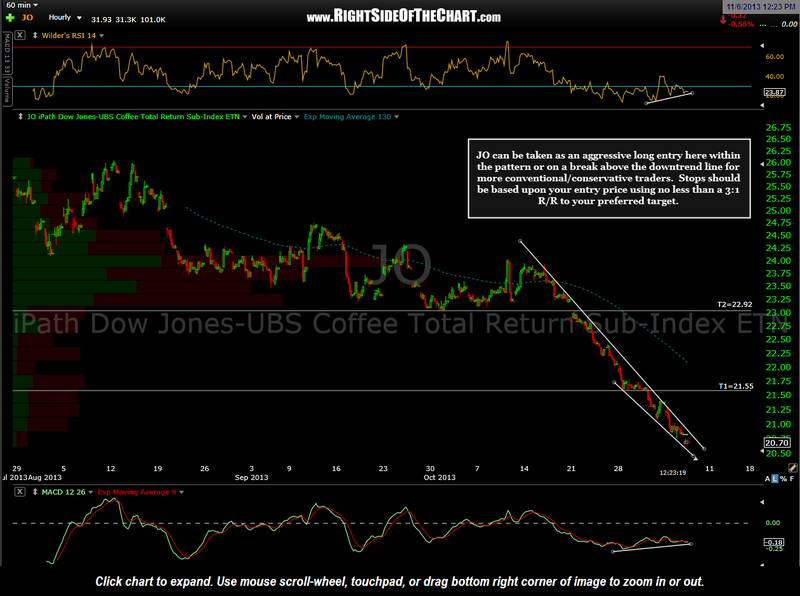 Regarding the comment above where highlights the comparison of JO vs. $COFFEE over the past year, first of all, most traders that bought JO or coffee futures a year ago most likely would have either taken profits on the huge rally that followed into the November top or, at the very least, been stopped out on the huge correction that followed. While I’m hesitant to make a comparison on JO vs. $COFFEE over the last year as any reasonable profit targets or stops for a swing trade & even a trend trader (i.e.- long-term trades) would have been hit & seen the trade closed out, a quick application of the measuring tool on my charts shows that over the 12 months, $COFFEE posted a gain of roughly 7.7% while JO posted a loss of roughly 3%. Not great but not the “RUN-RUN away as fast as you can” underperformance that the (obviously biased) commodities broker screamed of. Finally, as anyone following the site knows, I am as equally comfortable shorting a security as going long & in fact, usually have both long & short positions among various asset classes & sectors at any given time. On many occasions in the past I have highlighted the benefits of shorting a 3x leveraged ETF, particularly those in very volatile sectors such as NUGT, DUST, LABU & LABD, where the decay from the 3x leverage is most pronounced. For example, if I was bullish on the gold mining sector & thought that the trade had the potential to run for several weeks or several months, instead of buying NUGT (3x bullish gold mining ETF) I might short DUST (3x bearish mining etf) in order to gain long exposure to the sector. If GDX moves in the direction that I expect, my short on DUST should drop by at least 3x & most likely more, due to the decay from the leverage. If I am wrong, then I am stopped out & if the miners just slog around in a choppy sideways trading range for months, I will most likely profit as that is when the price decay from the leverage is most pronounced. While I rarely trade leveraged commodity ETNs & never for anything more than a quick trade or a short trade (for the reasons mentioned above), I do recognize that there can be an added benefit or outperformance of the underlying commodity when short a commodity ETN in a downtrend, especially for a prolonged period of time in a bear market due to an increased likelihood of contango, which occurs when deferred commodity prices are trading at higher levels than nearby prices. This often occurs during a bear market in a particular commodity as the result of an oversupplied market condition. When supply for the commodity exceeds demand, deferred prices are higher than current prices. As excess inventories depress current prices, future production will reflect current prices and output will decrease. Demand then increases in response to the low price, which depletes inventories, causing future prices to trade at a premium above the current price. As such, shorting commodity ETNs during a bear market could outperform shorting futures contacts (on a net exposure basis, i.e.- adjusting for the leverage in the futures contracts). BTW- Not all commodity ETNs are created equal. Some, such as the natural gas ETNs and to a lesser extend, the crude oil ETNS, particularly those that employ leverage, have a history of underperforming the underlying much more than the agricultural commodities ETNs. Comments & feedback, including different opinions, are welcome below. Just keep it civil & constructive. That’s a great explanation of the pros and cons. Thanks Randy. I would add one more consideration that might effect some traders and investors. Some of these instruments issue K1s. If that matters to you then check out the individual instrument before you trade it. Good point, thanks for mentioning that. There is an explanation of K1’s as well as a link to an informative article regarding ETNs & K1’s in the FAQ section under the sub-section “ETF Related Questions”. The FAQ page can be accessed on the menu bar at the top of the site.